Dear Santa: Jon's List - Dec. 11, 2017, 11:21 a.m.
Norco 2017 Range Carbon 650b & 29 - Feb. 22, 2017, 11:01 a.m. Agreed. Pretty insufficient given the riding they will see and not exactly a big hit on the scale. 3 Winter Gloves Reviewed - Feb. 20, 2017, 9:53 a.m.
Ha, funny that you noticed. I actually pulled my sleeve up for that shot. Plus on the worst of days I'm not really one to stop and shoot photos! 2017 Canfield Balance – First Impressions - Jan. 25, 2017, 9:25 a.m. I will throw the bike onto my scale tonight but I seem to recall it being around 33lbs when I first weighed it. Given that the bike was built with a mish-mash of parts, it's not running tubeless and there are some obvious components that could be lighter, I think that is reasonable. WTB Ci24 rims w/ White Industries XMR Hubs Reviewed - Jan. 18, 2017, 7:27 p.m. The theory is that could be the case. It's much the same with some carbon bars being too stiff while others do a great job of dampening vibrations. I've been told that some wheel builders are lacing these rims 2x to give some of that vertical compliance. Goes to show that so many things can vary based on the whole wheel build. WTB Ci24 rims w/ White Industries XMR Hubs Reviewed - Jan. 16, 2017, 9:50 p.m.
You would be surprised actually. It's something about the sort of higher frequency "chatter" that just feels sharper on the rims with a deeper section. 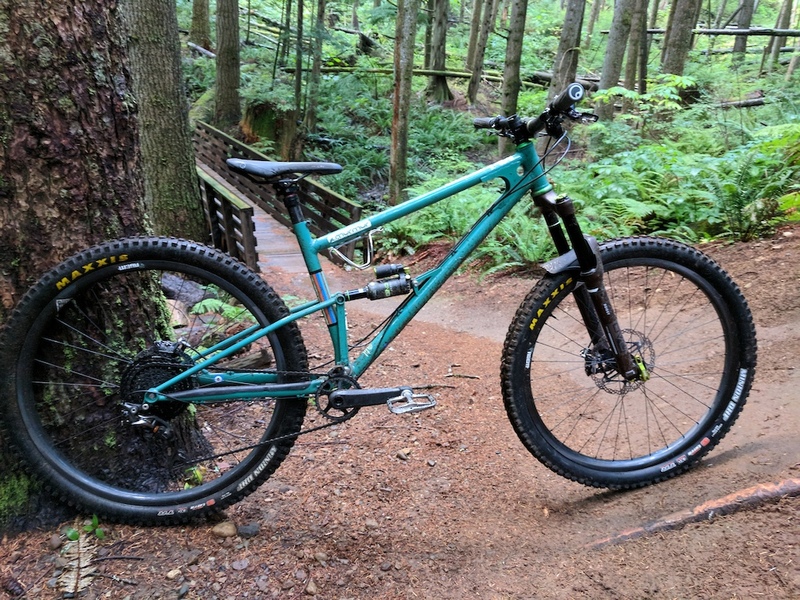 It's subtle and can be influenced by tire pressure, sidewall stiffness etc, but as I mentioned in the article I switched my wheels around between bikes and definitely noticed that the WTB rims translated a little more of the trail into the bike. WTB Ci24 rims w/ White Industries XMR Hubs Reviewed - Jan. 16, 2017, 1:03 p.m.
Yeah sorry about the exchange rate issue right now. Don't see that changing soon either. WTB Ci24 rims w/ White Industries XMR Hubs Reviewed - Jan. 16, 2017, 1:02 p.m. Without writing another article I'd sum it up that these rims ride very similarly to the first and second generation Enve rims (I haven't had any time on the recent wider profile models). Also quite similar to the Reynolds rims. They are stiff laterally but also vertically as I mentioned. I have lots of time on the Nobl TR33 and NOX Farlows and those two rims definitely seem to have more vertical complaince to their ride. Claimed weights seem to be very similar but so often we have wheels fully built up sent to us so don't have a chance to check rim weights individually. WTB turns out great product and these rims certainly seem to be continuing that habit. Internal Brake Routing?! - Jan. 9, 2017, 1:33 p.m. I don't mind gear cables running internally but brake ones with stupid little holes so you have to remove your fittings is just dumb in my mind. Makes for a load of mess, way more work and way more swearing as I'm fishing around my downtube trying to retrieve the thing. I actually quite like the external/internal combo on the Evil bikes. The brake is totally external and under the top tube with the rear derailleur cable which then goes internal through the rear triangle. That's just sensible to me. NOX Farlow Carbon Wheels: Reviewed - Sept. 17, 2016, 3:27 p.m.
Re: NSMB - 2017 - Full Suspension Bike Thread - Dec. 14, 2017, 8:20 p.m.
Nice bike! Custom steel is pretty darn cool. Not sure I could stomach the price of that one though. Enjoy! Shockingly not as pricey as you might think. Keep an eye on what starling have in store for 2018. Re: NSMB - 2017 - Full Suspension Bike Thread - Dec. 14, 2017, 7:50 p.m. I'd guess they are the alloys based on the shape where it meets the crank-arm. You are correct. I'm very impressed with the pedals. They just feel right. Re: NSMB - 2017 - Full Suspension Bike Thread - Dec. 11, 2017, 1:13 p.m. I like to tease.... but fine I've edited the original post with the details. Re: NSMB - 2017 - Full Suspension Bike Thread - Dec. 11, 2017, 11:27 a.m.
As built with the EDC it weighs in at 32.5lbs. Ride wise... silent, smooth and picks up speed and maintains it exceptionally. I'm shocked with the grip that this bike seems to find and have been reveling in the slingshot effect when I let it run tear through a corner. Admittedly getting the rear shock set up took some time but now the bike is dialed for my tastes.